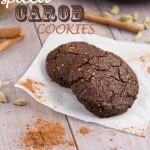 Chewy carob cookies with a hint of cardamom and cinnamon. Preheat oven to 350F and line a baking sheet with parchment paper or a silicon baking mat. Set aside. Combine dry ingredients in a large bowl, whisking until combined. Set aside. Combine wet ingredients in a small bowl, whisking until combined. Add wet ingredients to dry and mix with a spoon until fully incorporated. The mixture will be thick, just keep turning it over until all of dry pieces are part of the large mass of dough. 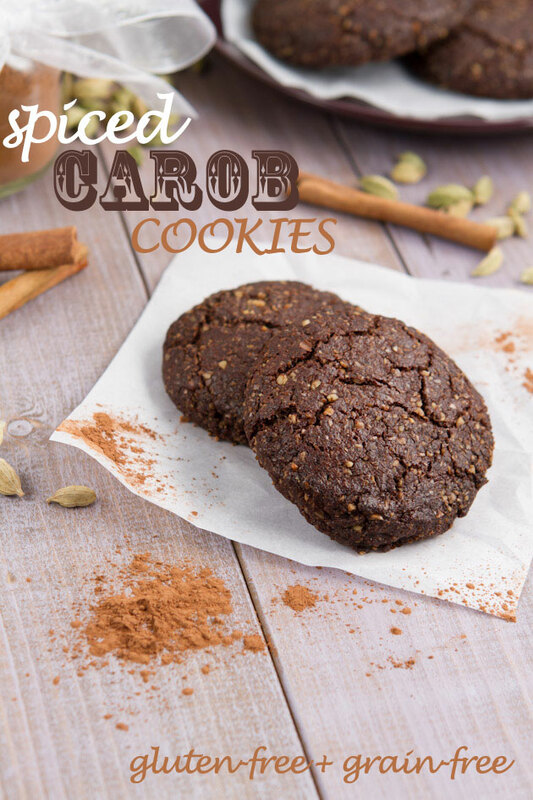 Scoop cookie dough into a 1/4 cup measuring cup, turn over and flop onto the preparing baking sheet leaving around 2-inches between each cookie. Press down on the cookies lightly. Then place in the oven to bake for 13-16 minutes, until tops are slightly cracked and your house smells like a bakery. Remove the baking sheet from the oven and allow cookies to cool on the pan for 30 minutes or so. If you’re allergic to nuts you can try to substitute the ground walnuts with ground sunflower seeds instead.